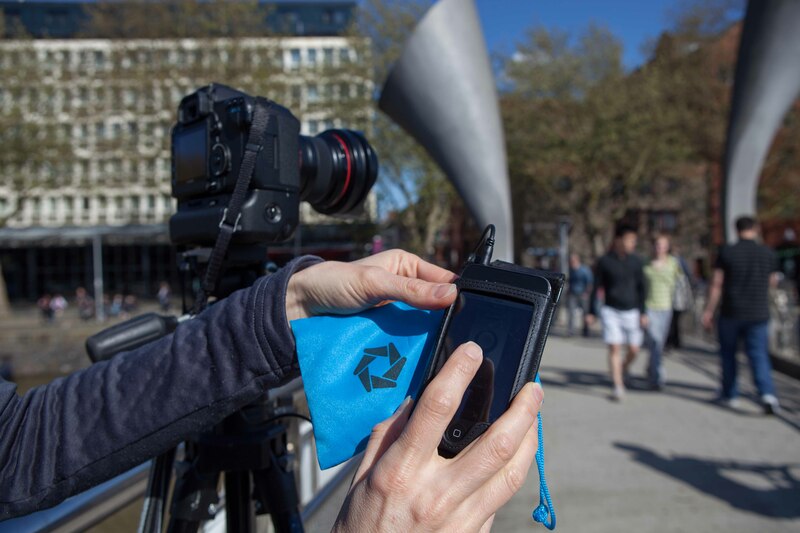 Freia & Helen took the ioShutter to Bristol Harbour for a Time-lapse shoot. …then we headed for Bristol Harbour to find a good location for our Timelapse. After a wee bit of wandering we found a good spot on Pero’s Bridge and set up the tripod & camera. Next we connected the ioShutter cable to the iPhone and turned on the ioShutter LITE App (that’s the free one). 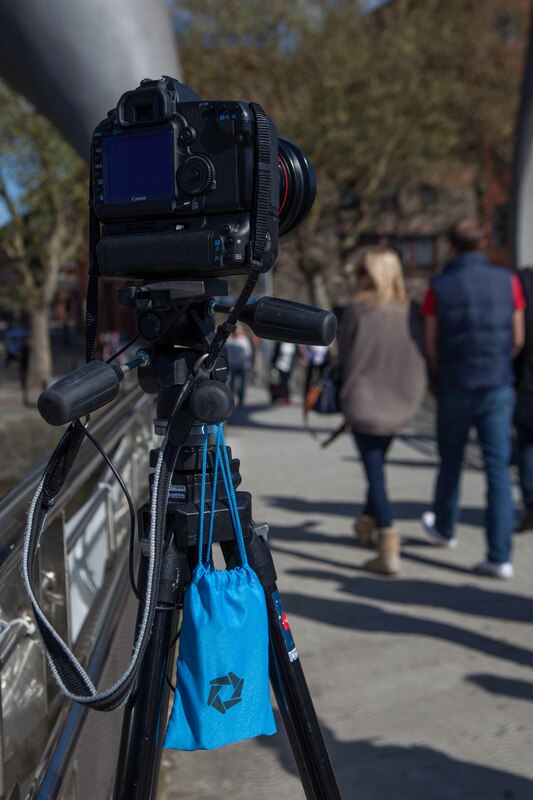 While the ioShutter was working its magic we hung the phone in the blue bag that comes with it on the tripod and kept an eye on the passing pedestrian traffic to ensure our gear stayed in place!! Ensure your sensor is clean – every little spec of dirt will show up! Charge all your batteries before heading out! We put all the JPEG images from one 10 minute Timelapse shoot into ONE folder on the computer. Then we used some Time Lapse assembly software to create the movie. Typing ‘Time Lapse Assembly’ or ‘Time Lapse Assembler’ or ‘Time Lapse Software’ into a search engine will give you a multitude of free & paid for software to choose from and lots of useful websites guiding you through this too. Apple’s QuickTime 7 Pro (Mac/PC) (paid) is also highly recommended. Just for fun, here’s one of the most amazing timelapses that I think has ever been made… something to aspire to!! This entry was posted in Accessories, Enlight Photo, ioShutter, Photographer, Road Test, Video and tagged Bristol, cable, canon, Freia Turland, Helen Atkinson, ioShutter, lapse, Neil Lucas, time, timelapse. If you’re in the Gloucestershire area, then you can find out more about the Think Tank Photo bag range by visiting the Clifton Cameras store in Dursley. This entry was posted in Backpack, Clifton Cameras, In Store Event, Retailer, Road Test, Sling-O-Matic, Think Tank Photo and tagged Bag, baggage, Bags, Clifton Cameras, Photo, retailer, road test, sling, Sling-O-Matic, Snapperstuff, Tank, Think, Think Tank Photo. Snapperstuff’s Sandra Clark and husband Gareth road test the Think Tank Photo Retrospective 10 pinestone, at Marwell Wildlife Park, Hampshire. This entry was posted in Photographer, Photography, Retrospectives, Road Test, Shoulder Bags, Snapperstuff, Think Tank Photo and tagged Bag, baggage, Bags, bird, Gareth Clark, Kookaburra, Marwell, park, Photo, Photographer, Photography, Retrospective, Retrospective 10, Sandra Clark, Shoulder bag, Snapperstuff, Tank, Think, Think Tank Photo, Travel, Wildlife, zoo.